From the diary of a fashion designer : Kutch embroidered yokes , tales of history woven into them ! Kutch embroidered yokes , tales of history woven into them ! One couple from the 'Rabari tribe' from the Kutch of Gujarat visits me sometimes when they travel to Delhi. This couple with Character written all over their faces come in their native dress which is a black backless choli and skirt for the woman and a dhoti kurta for the man with the turban ! They come with their bag of goodies of exquisitely embroidered yokes which is like a treasure to me ! The older the embroidery , the more intricate and beautiful it is ! These embroideries are not just pieces of Art but they have tales woven in them. A closer look at them and you can see the skill and the patience with which these threads are woven into each other to make complex designs. In the cities if we people could develop even one hundredth of that patience lives would be much simpler. I wonder if that was one of the reasons why Gandhiji insisted on everybody to churn the wheel of the charakha ? To be behind the wheel of a fancy car is the only wheel , city people fancy and that too with little patience ! The beauty , colours and the complexity of the designs are just a glimpse into their beautiful minds which can conjure up these ! 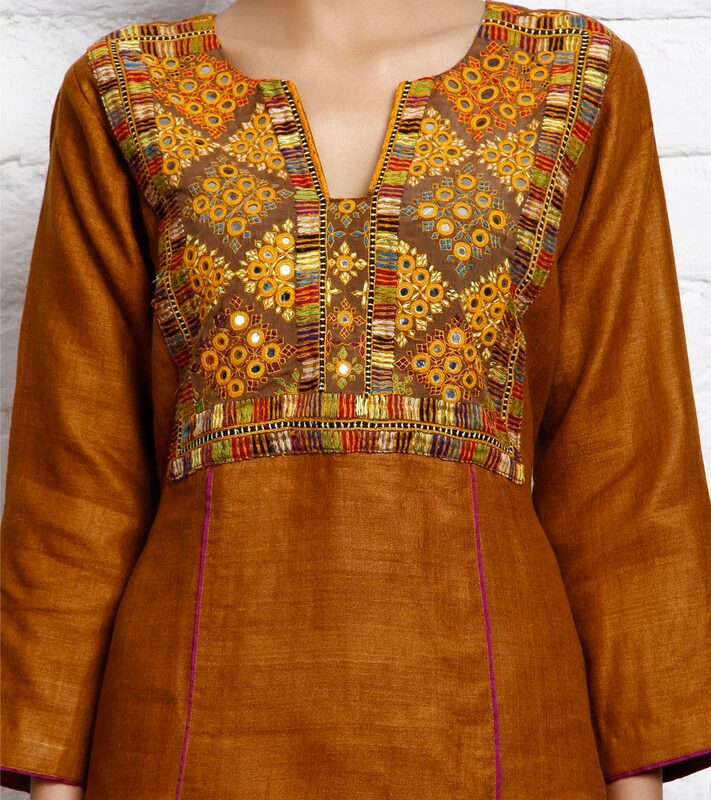 A kutch hand embroidered yoke on raw silk kurta . The myth about their origin is that they were put on earth by Lord Shiva to tend to the camels owned by Parvati. These tribes are mostly spread across Gujarat and Rajasthan and said to have travelled from Afganistan. 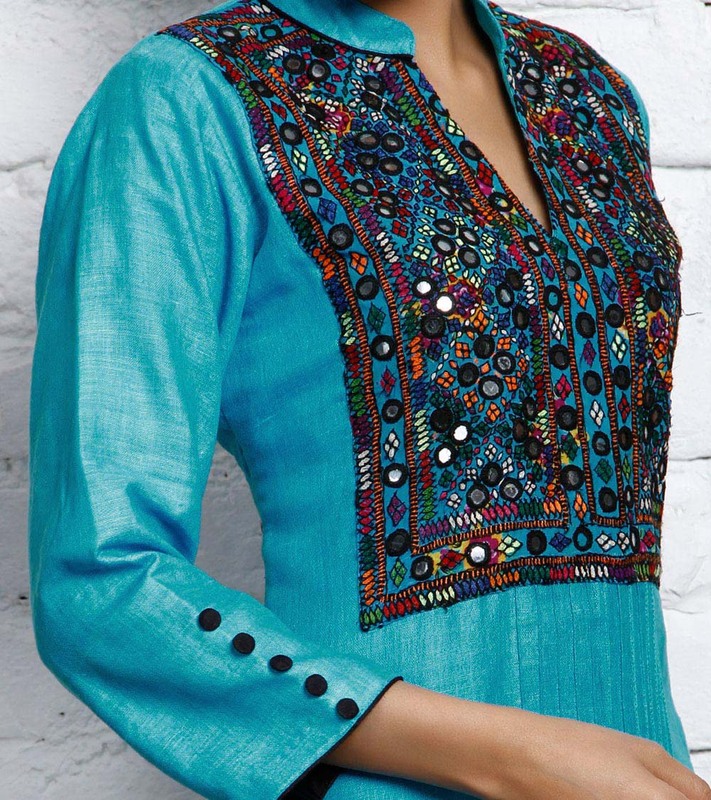 A hand embroidered yoke with mirrors on a matka silk kurta. Each time you wear any of these creations think of them not just as embroidered yokes but the emotions and desires of the people woven into them , they carry history with them ! All that Glitters is Gold ! Celebrating 69 years of Independence ! Chiffons , means Sensual ! 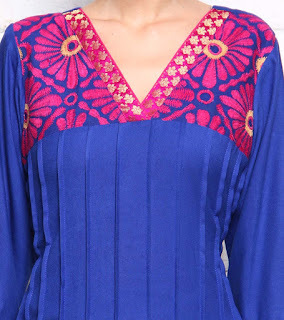 Bagh Prints , the ancient legacy ! When will it be a WOMAN'S WORLD ? Colour White , the purity of Soul ! Muslin , Fabric of the summer ! Kanjeevaram , fabric of the Gods ! A young girl who has dreams in her eyes !